These Scorpion King Heavy Glass Bong are one of the latest additions to the Shiva catalogue and we absolutely love them. Measuring 23cms high, these heavy glass bongs are prefect for beginners and experts alike and are a cost effective way to enjoy your favourite herbal blends. 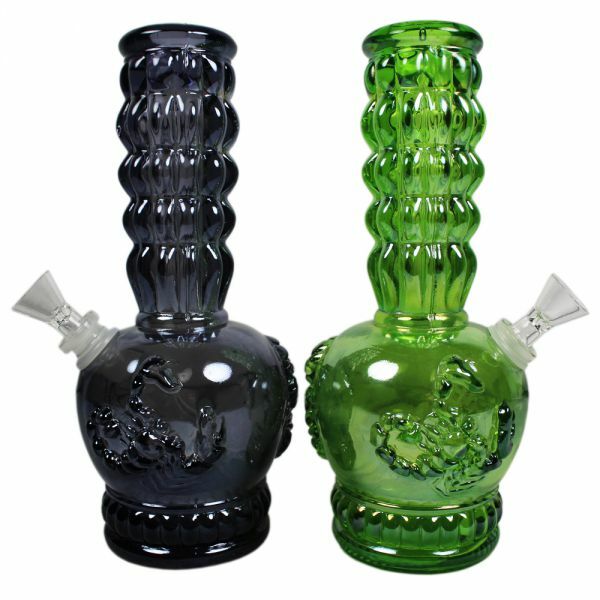 Available in 2 colours, green and purple, the Scorpion King heavy glass bongs are embossed with scorpions on the base and a decorative pipe, making them not only smoke great but look great too. At just £9.99 each, these bongs are ideal for those looking to start using bongs and experienced smokers who want to add to their collections. To keep you Scorpion King glass bong in tip-top condition, we recommend using bong cleaners and pipe cleaners to clean and odourise your bong after heavy use. Looking like a piece of art work, the Glass Ice Twist Dragon Bong is both functional and eye-catching at the same time. 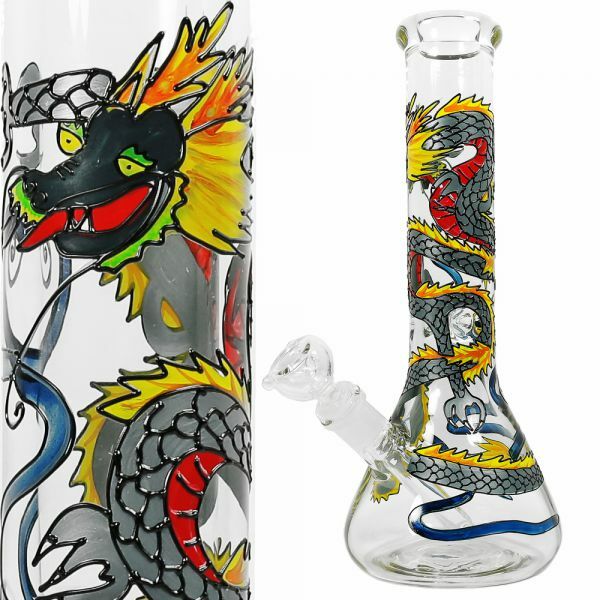 This 33cm tall glass bong features an embossed dragon design that sweeps around the whole bong. Other features include a beaker style body with a large base for stability, an ice twist for a cool smoke and a glass down stem and bowl for ease of use. Easy to clean and providing a much smoother smoke than an acrylic bong, the Glass Ice Twist Dragon Bong is great value at just $49.99. For those who want to keep their bongs in pristine condition, why not check out our range of cleaning products, bong brushes and pipe cleaners here. The Mafia has always held a fascination for many people, the film The Godfather was a box office hit and it allegedly was based on the life of one of the “Five Families” that grew into the “Mafia” in the USA after Mussolini chased a large number of real Mafiosi out of Italy and they immigrated to the USA. They made their fame, as well as considerably fortune, peddling drugs and booze, when alcohol was made illegal in the 1920’s, an era known as “Prohibition, this was when Carlo Gambino became to be known amongst the gangs as the Godfather. We are unsure whether the reason some buy this great bong, is because they are fans of the film, but what we do know is that the feedback we have had from buyers is that this is an elegant, functional and must have smoking piece. The “Carlo Gambino” brought to you from the “States” by us, is perfect for use as a traditional bong for herb, or oil dab rig; we can vouch that this is undoubtedly one of the very best double diffuser 2in1 bongs we sell at Shiva! Standing 320mm tall, the rig is manufactured from sturdy borosilicate glass and features a detachable bowl and dab rig, with quartz nail and dome, which you can change around whenever you like to suit your particular purpose. 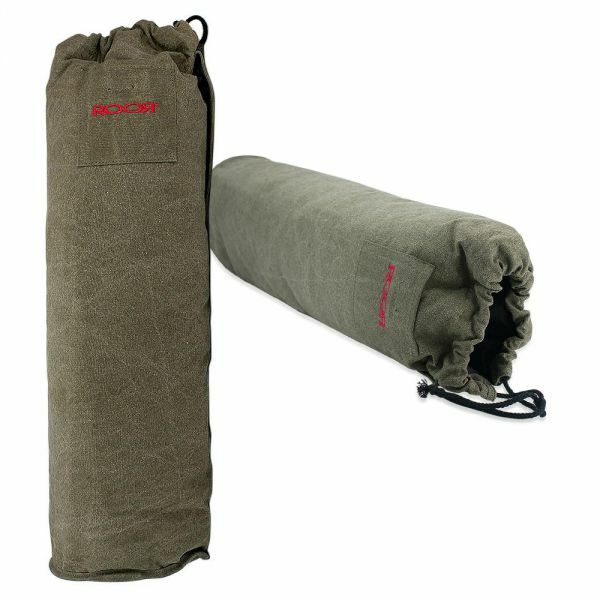 Now add to that; this also comes with a 4 button percolator that will ensure you the best filtration possible, an absolute guarantee that you will get the very best from your product! Godfather or not, you will be hard pressed to find a better bong than the Jaxx USA ‘Carlo Gambino’ 32cm Bong/Oil Rig! 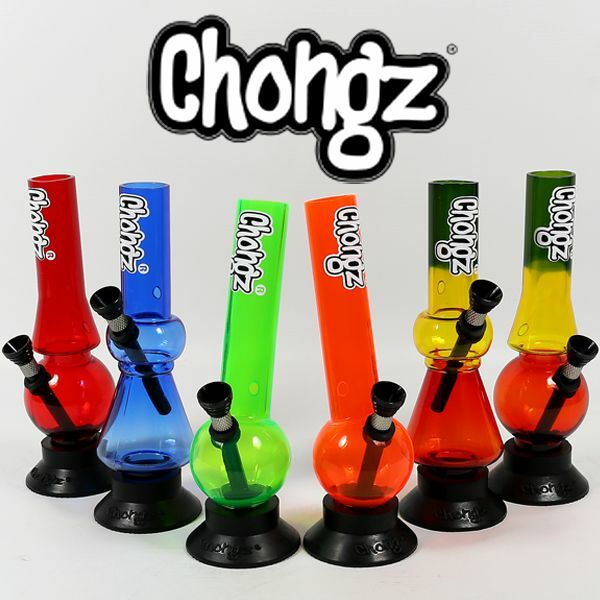 If you are searching for a top end percolator bong, you have come to the right page, this is where you will find the bong that is manufactured in Sothern California made from high-grade borosilicate glass, which are engineered to perfection for those who want the quality and durability of a high-end piece at an affordable price. With you the smoker in mind, Bio has designed a bong with some novel and great features. With the two turbines, the first turbine percolator creates a whirlpool of water which slowly rises as you inhale, which in turn means that the surface area of the water which is in contact with the smoke is increased as you inhale, before it then travels into a beefy 12 arm tree percolator which will bubble and filter your smoke to perfection. Bliss, your perfect hits of cool smoke delivered every time. Complete with a with a two handle 18.8mm bowl, with a neatly designed built in glass gauze, this beauty measures up at 125mm (w) x 300mm (h) x 115mm (d) and offered by us £80.99.